The Driver and Vehicle Standards Agency (DVSA) and the driver training industry place great emphasis on professional standards and business ethics. This industry code of practice has been agreed between the National Associations Strategic Partnership (NASP) and DVSA. It is a framework within which all instructors should operate. These professional bodies expect their members to adhere to this code of conduct. One of the main things that people should look for when choosing a driving school is that their instructors should be encouraging and very positive. 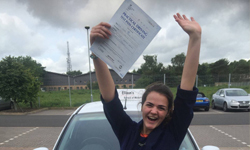 Sometimes, when starting driving lessons with a new instructor it can be a daunting experience, however, we can assure you quality of service. I always thought learning to drive would be very difficult but my instructor Steve made things very simple and easy to understand. 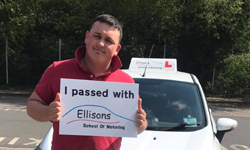 I would recommend everyone who wants driving lessons in Taunton to take driving lessons with Ellisons School of Motoring. Thank you so much Steve. I am now a confident and safe driver. I was recommended to Ellison's Driving School in Somerset by a friend. My friend was always telling me how he loved his driving lessons and kept going on about it. So, I thought I would give Ellison's a call to start taking driving lessons in Bridgwater and I soon realised that my friend was right. If you're looking for a driving school in Wellington then make sure you give Ellison's School of Motoring a call. I was nervous at first but my instructor was amazing. I had heard of Ellison's and that they were good and I soon realised for myself that they very good, in fact, not just good, but bloody brilliant - Thank you Ellison's. 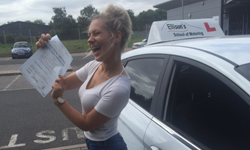 Ellison's School of Motoring is the No1 Driving School in Somerset. Guarnateed stress free learning.